By this means he is ex­tending to the classes who have neither the time nor the money to devote to classical courses the means of improving their minds. The public library is at once the most popular and as well the most valuable factor in the education of the great mass of the American people, and no man has done more to fos­ter the growth of the free-library system than has the Scotch steel mag­nate, while his plan of philanthropy is such that, while lending every aid to the establishment of these libraries, he insures their self-support by exacting the promise that the municipality benefited shall continue the work he has begun. In only a very few instances has he assumed the burden of supporting the institutions he has founded. Instead it has been his aim to make them to an extent self-supporting, in the sense that the cost of maintenance is borne by the taxpayers of the city in which the library is located. The exceptions noted are in the case of the libraries which are principally patronized by the employees of Mr. Carnegie. These are supported out of his own purse. The start of the library idea was small enough in itself. Half a century ago, when Andrew Carnegie was a bob­bin boy in an Allegheny mill, Colonel James Anderson, one of the leading men in the iron industry of that day, threw open his small library of four hundred books to the youths of the city. It was a private beneficence, but several men who have since figured largely in American literary and social life got their first taste for learning from Colonel Anderson's library. 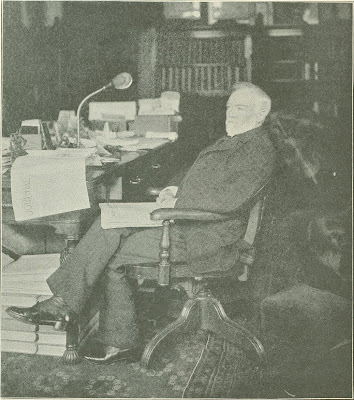 At that time Mr. Carnegie, who was in the receipt of one dollar and twenty cents a week, had little idea that he would someday attain a position in the steel industry far in ad­vance of his librarian; but the lad had ambitions, and he made the mental resolve that, should opportunity ever offer, he would extend the same benefits to others he was then enjoying. The Anderson library was eventually developed into a public institution, and existed as such till the civil war, when the volumes were stored till 1865, when they were turned over to the Allegheny Literary As­sociation. Oddly enough, when the Carnegie Free Library was started in that city, there was a movement set on foot to turn the col­lection over to that insti­tution, and only legal com­plications prevented the merging of the volumes that formed the germ of the Carnegie libraries with one of the collections that were the outcome of Mr. Carnegie's resolve. 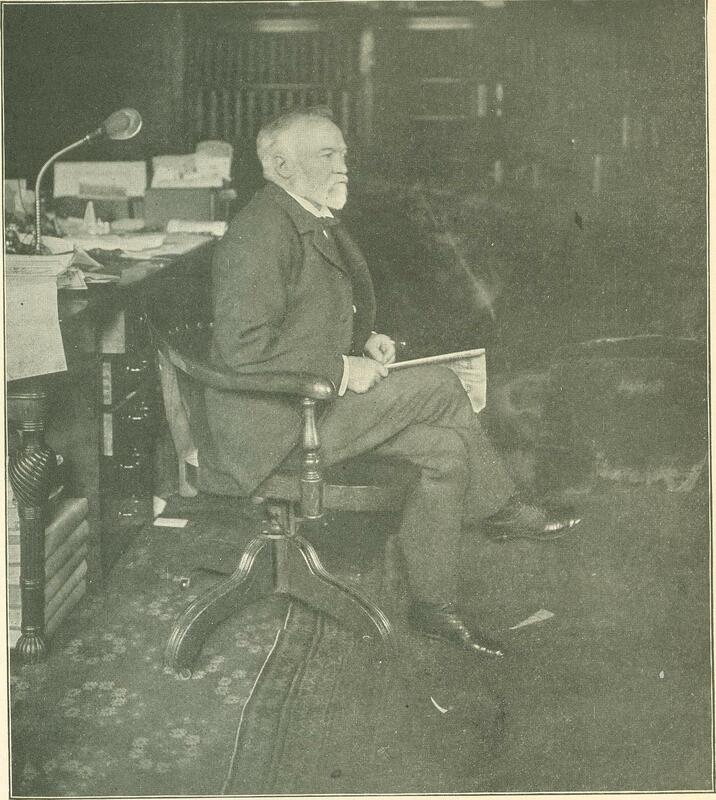 The library at Braddock, Pa., was the first estab­lished by Mr. Carnegie in the United States. 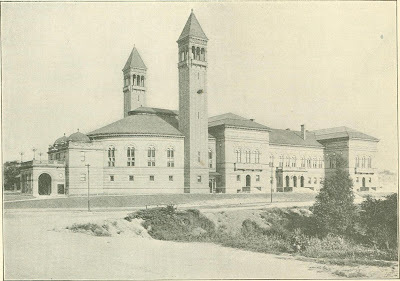 This was opened in March, 1889, and its scope is more that of a people's institute than a library proper, since in­cluded in the building are a swimming pool, billiard rooms, a gymnasium, bath rooms, and an auditorium supplied with the large pipe organ which is a sort of Carnegie trademark. This library is supported at Mr. Carnegie's expense, in view of the large number of his employees who profit by its benefits. The origi­nal gift was $75,000, af­terward increased to $300,000. Last year the cata­logue showed 16,652 volumes, while the libra­rian's records showed a circula­tion of 78,142 volumes. 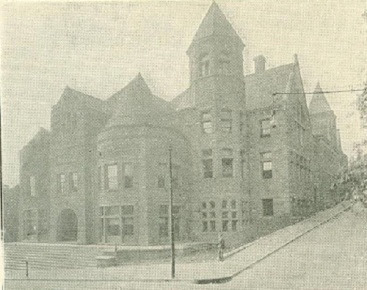 Another three hundred thousand were devoted to the library in Al­legheny, which was opened in 1890, though the circulation of books did not begin till 1891. The gift was made upon the implied condition that the city should appropriate not less than $15,000 yearly for its support. The council has done better than this, however, the average being $20,000, and in recognition of this support Mr. Carnegie recently increased his dona­tion by $25,000, to be expended in en­larging the book stock, grown too small to accommodate the increasing collection, now numbering more than 40,000 volumes. This building does not embrace the club features of the library at Brad­dock, but embodies an art gallery, a lecture hall, and a music room with a large pipe or­gan. The Carnegie library at Home­stead more nearly resembles the in­stitution at Brad­dock, and in ad­dition to the libra­ry there is an athletic club, pro­vided with all the gymnastic appa­ratus needed, as well as baths, a swimming pool, and a music hall. The club features are not free, but employ­ees of the Carnegie Company are ad­mitted to its privileges for a yearly fee of four dollars, and outsiders are re­quired to pay only six dollars. The library itself consists of some seven thousand carefully selected works, and has been open little more than two years. 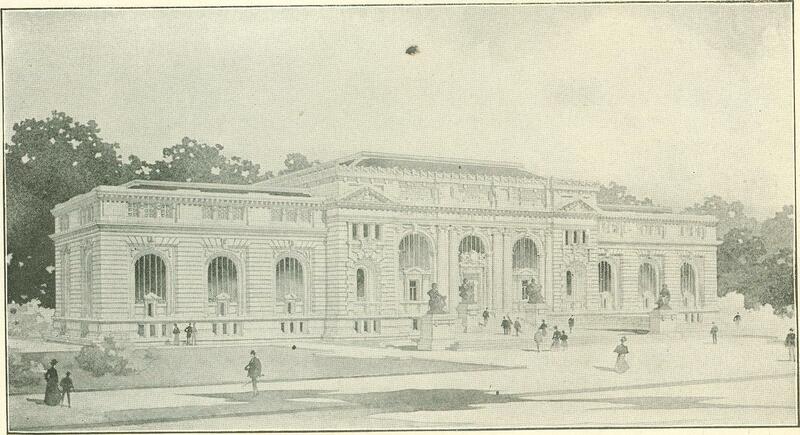 The most important of what may be called the "Pittsburg group" is the Carnegie Institute in Pittsburg itself. 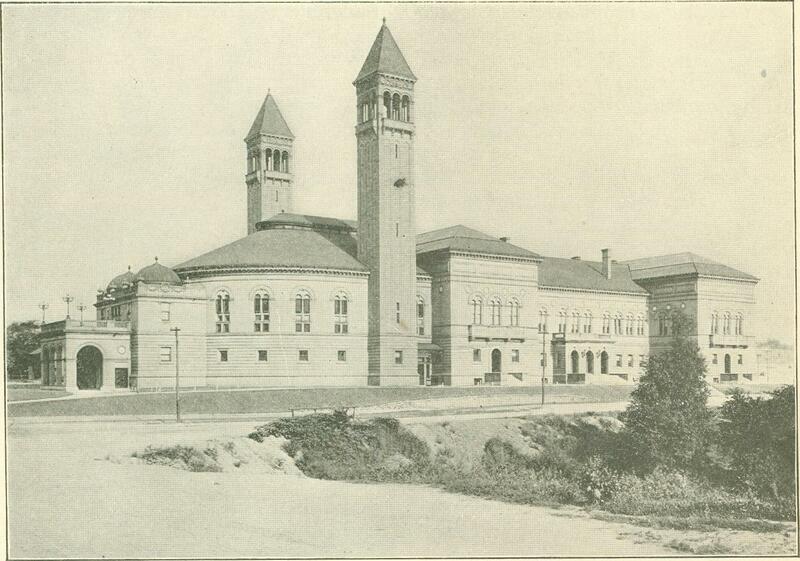 In all Mr. Carnegie devoted $3,860,000 to this institution, which is located in Schenley Park. The library feature includes the establishment of seven branches at various points in the city, where read­ers may draw books from the central library without having to make the trip to the park. The Institute also embodies a muse­um, art gallery, and music hall, and in connection with the latter is main­tained one of the few permanent or­chestras in the country, under the leadership of Victor Herbert. One unique feature of the library is the establishment of a special children's department, which last year was made a special branch of the work. The de­partment not only has supervision of the children's rooms of the main library and its branches, but it includes the installation of what are termed home libraries—collections of books which are placed in charge of bright boys in various parts of the poorer quarters. These boys take charge of the books at their homes and act as libra­rians, serv­ing the books to the chil­dren of the neighbor­hood. When one collection has been read by its pa­trons it is replaced with another. 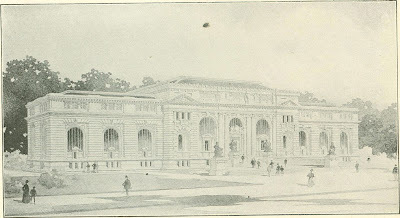 The library at Carnegie, Pa., is now in course of construction and completes the Pittsburg system, which comprises what may be termed Mr. Carnegie's home benefactions. The Carnegie Hall on West Fifty-Seventh Street, in this city, is too well known to require attention here, and Mr. Carnegie's most recent benefaction is still fresh in mind—the bestowal of $300,000 upon the Cooper Institute for the maintenance of a day school of mechanical work. This was made at the close of last year and enables the trustees to at last complete the scheme laid out by Peter Cooper, which for lack of funds has not till now been possible. As a result the usefulness of this institution will be greatly increased. But Mr. Carnegie has not confined his liberality to this side of the water. He is a Scotchman by birth, and the first library established by him was at Dunfermline, the place of his nativity. This was established in 1881 by a gift of $40,000, conditioned upon the adop­tion of the "Free Libraries" Act by the town. Five years later he devoted a quarter of a million dollars to the founding of the library at Edinburgh, one of the best in the United Kingdom and the best in all Scotland. 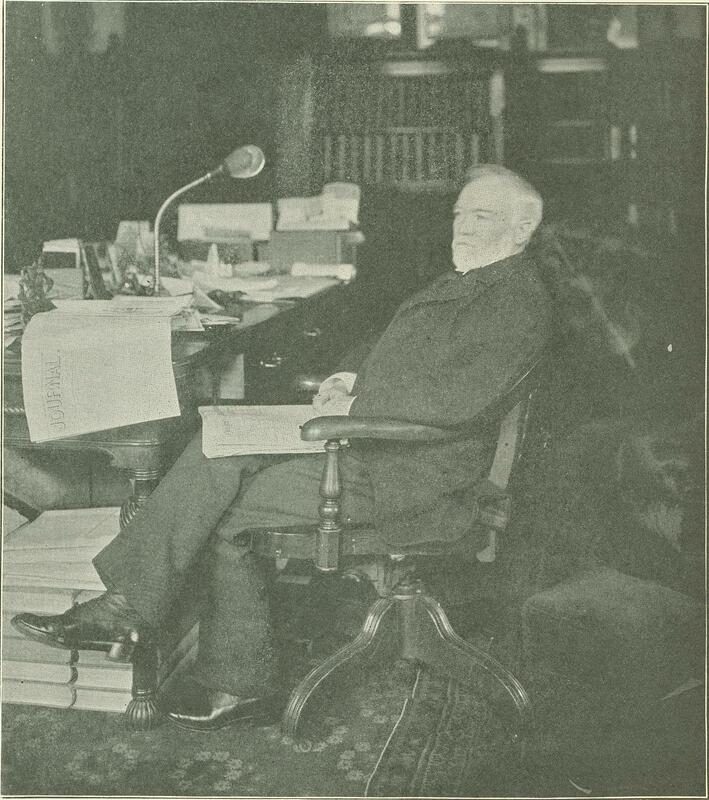 The library at Ayr followed, and in 1890 Mr. Carnegie, by a gift of $8,500, relieved the library at Inverness of the indebtedness that threatened to terminate its useful career begun in 1877. The library at Wick is another of his founda­tions. He virtually made possi­ble the foundation of a suitable li­brary and museum at Peterhead, and has made many other donations to libraries in various parts of England and Scotland. Some little time ago, when Mr. Car­negie expounded his new gospel of wealth, he took the country by storm, and few men have excited as much dis­cussion as he by the argument that "the man who dies rich dies dis­graced." Having spent the early years of his life in amassing a fortune large even for America, he announced that he would spend the rest of his time in so expending his wealth as to benefit the greatest possible number of persons, and during the year just past he gave more than five million dollars to various charities, for the most part connected with his library scheme. He has not confined himself to this alone, nor has he by any means de­voted his expenditures only to those schemes which would directly per­petuate his name. The libraries known as Carnegie were all built by him, and for this reason it is well that the name of the founder should be embodied in the title; but no scheme for the benefit of the people has lacked his patronage, provided he be convinced it is for the people's good. Carnegie Institute, Pittsburg, $1,­750,000; Public Library, Washington, $350,000; Birmingham, England, Uni­versity, $250,000; Polytechnic Library, Louisville, $125,000; Public Library, Atlanta, $125,000; State College, Belle­fonte, Pa , $100,000; Dunfermline, Scotland, $100,000; Library, Lincoln, Neb., $75,000; Library, Fort Worth, Tex., $50,000; Library, Oakland, Cal., $50,000; Stevens Institute, Hoboken, $50,000; Connellsville, Pa., $50,000; McKeesport, Pa., $50,000; Houston, Tex., $50,000; Sedalia, Mo., $50,000; Uniontown, Pa., $50,000; Davenport, Ia., $50,000; Sandusky, Ohio, $50,000; Tyrone, Pa., $50,000; Duluth, Minn., $50,000; Dallas, Tex., $50,000; East Liverpool, Ohio, $50,000; Steubenville, Ohio, $50,000; San Diego, Cal., $50,­000; Allegheny, Pa., $25,000; Oak­mont, Pa., $25,000; Oklahoma City, $25,000; Tucson, Ariz., $25,000; Newport, Ky., $20,000; X. X. I. Women's Club, Denison, Tex., $17,000; Blairs­ville, Pa., $15,000; Alameda, Cal., $10,000; Zoological Gardens, New York, $5,000; Hazelwood, Pa., $4,000; Cale­donian Club, New York City, $2,752; Dallas, Tex., $1,000; Seaboard Air Line, $1,000; Eastport, Me., $600; Oil City, Pa., $500; Blue Rapids, Kan., $500. There are many more smaller bene­factions, and these, with others not yet ready for publication, will bring the total up to $5,000,000. From Metropolitan Magazine, April 1900.